We all want it… to design something awesome, something that makes everyone go “wow!” But to get there, we have to pass the ocean of “bad”. In every designer, developer, entrepreneur – well, in everyone involved with building interfaces, products or services (digital or not) – there is a desire to build something ultimately beautiful, functional and desirable. Some kind of shiny pyramid, an ultimate result of our skills & imagination. Blazing it’s intended users with amazement, relieving them from painful experiences and improving their lives. Such a dream isn’t unreasonable in any way, because most of us have at some point experienced them. Those shiny ”pyramids” that somehow struck us with an intuitive feeling of joy. Maybe it was a mobile app, or a similar digital product. Maybe a pair of headphones. Maybe something completely different. There is, however, a huge challenge when it comes down to building such a product. When you feel that you want to build something really, really amazing & great. The challenge is, that you have to start with building something bad. Yes, you heard me right. And NO, I am not talking about some kind of special use case that doesn’t really apply to you. This does apply to you, and everyone around you. You. Have. To. Build. Something. Bad. That’s really hard to admit to yourself. Even harder to confess to – say, your boss, or your team, or you department. ”Hey, let’s slow down a bit and build something bad first”. Nah-ah. Doesn’t sound like something that’ll earn you a Christmas bonus. A good UX designer should have fully adapted this mindset, but the big struggle is then to try and transfer this knowledge to other stakeholders. Still in the year of 2018, such an enormous majority of people and companies still haven’t understood this vital part of how UX design & and a Human Centered approach works. That the sole key to success, is to admit to yourself that you’re gonna build something more or less bad to start with. Then, you’re gonna build something slightly less bad. And then something slightly better. This is the actual core of Design Thinking. Ultimately – with the right mindset and approach – you may actually build something wonderful. But, if your reaction to something bad is to throw it in the garbage, it is very unlikely that you’ll succeed. 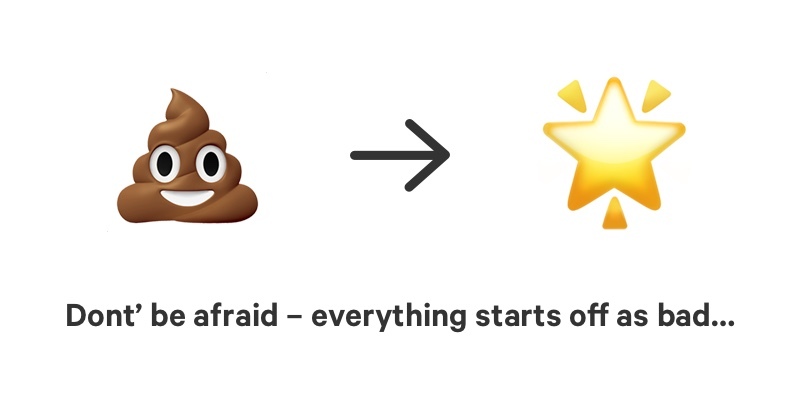 You shouldn’t be afraid of designing bad things – embrace it and just try it! It’s actually extremely comforting to know that you don’t have to make something great at your first go. It will just come, eventually. This request isn’t wrong by default – however, if the result is expected & demanded to be amazing at the first try, then it will fail in about 100% of the cases. Somehow, all of these more or less successful organizations seem to have forgot how they reached success in the first place. What made them keep going, in times when their outcome wasn’t amazing at all. The word ”bad” is actually not even the right word to describe the subject of this text. That’s why we UX designers rather talk in terms of low or high fidelity. 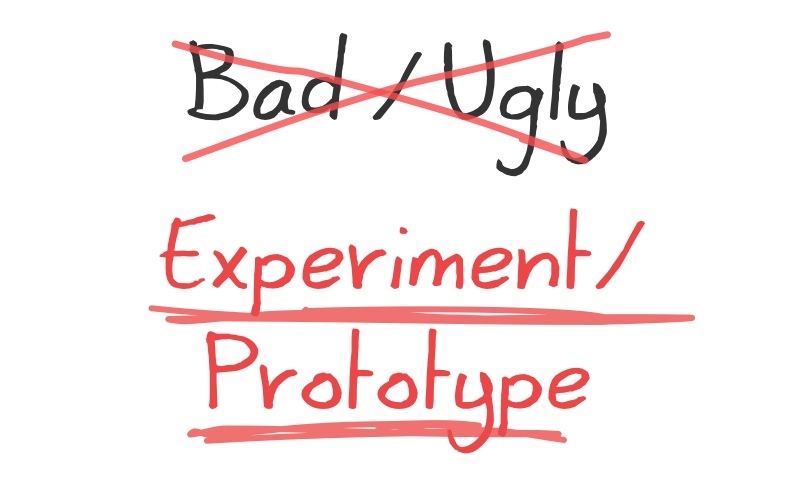 Calling a prototype ”bad”, is like saying that the first part of any science study is bad. Or that any new class of school kids are bad. And so on. The word ”bad” is one of the biggest lies within todays corporations. This is the first one in a coming series of articles, where I will teach you the basics needed for building great products. Only, we’ll spend 100% of the time talking about bad products – the mother of all great solutions.